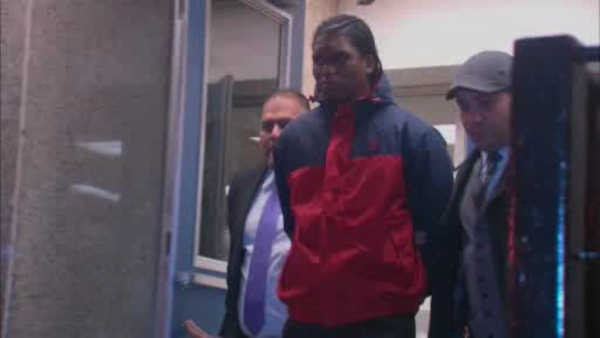 FLUSHING, Queens (WABC) -- Police have made an arrest in connection with the death of a woman whose mangled body was found on a dirt path in Queens in October. Authorities say 25-year-old Christopher Sobers was taken into custody Monday night and charged with second-degree murder and other charges after 28-year-old Qing Qing Kiemde was found dead in Kissena Corridor Park in October. Police believe Sobers was an acquaintance of the victim. Kiemde was found with a laceration to her throat and abdomen, and she had eight puncture wounds to her torso. "The crime scene in this case was horrific," Queens District Attorney Richard Brown said. "The victim was brutally killed, and her bloody body mutilated and disemboweled. The defendant is now in custody and faces spending the rest of his life in prison if convicted." Sobers is charged with second-degree murder, first-degree robbery, third- and fourth-degree criminal possession of a weapon, tampering with physical evidence and fifth-degree criminal possession of stolen property. He is due back in court on January 29. Kiemde lived in Elmhurst and worked in a nearby bakery. Her body was found by a homeless man near Colden Street and Laburnum Avenue.